Gary Van Egmond only made one change from the side that was soundly beaten by Sydney FC last week, with Michael Bridges replacing James Virgili. He did, however, reformat the attacking quartet: Adam Taggart played on the left, Craig Goodwin went to the right, and Nathan Burns played in behind Bridges. Alistair Edwards, too, only made one change from his opening round defeat, to Adelaide. Ryo Nagai was injured, so Adrian Zahra started wide on the right. With both sides deploying similar 4-2-3-1 formations, this match was largely about two sides playing in front of each other. Indeed, the 4-2-3-1 shape has become the A-League staple: along with these two sides, Western Sydney, Wellington Phoenix, Central Coast Mariners and Melbourne Heart all used it in round one. Formation is dictated by style and different coaches use the shape for a variety of reasons, but Van Egmond and Edwards had relatively similar game-plans here – instructing their players to try and create 1v1 situations down the flanks, and, with all four wide players tracking back diligently out of possession, to prevent 1v1s against their own full-backs. That was particularly obvious from a Perth Glory perspective, as the central defenders were frequently looking to hit flat, accurate diagonals across the width of the pitch towards Sidnei and Zahra, who positioned themselves close to the touchline. The full-backs also moved forward on the ball and hit balls down the line for the teammate further ahead. Sidnei, for example, received a large number of passes wide on the left, often from Scott Jamieson, but struggled to dribble past Scott Neville, who was assisted by Connor Chapman who moved across to the channels to cover. 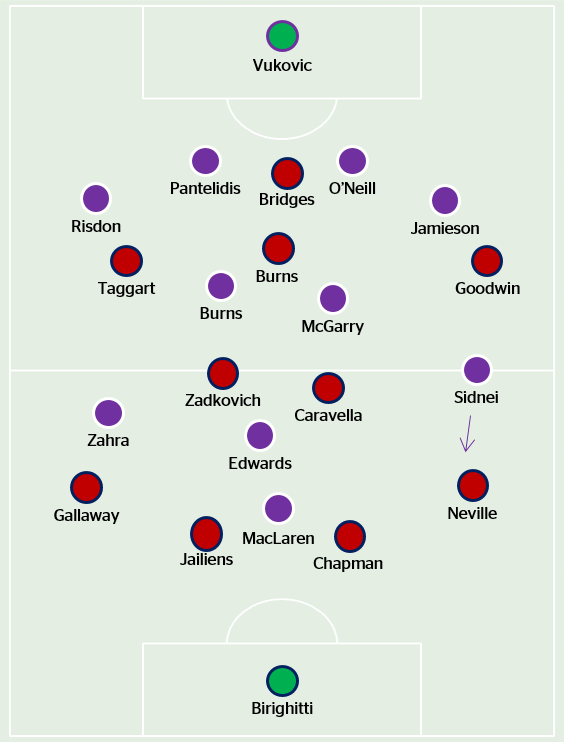 Newcastle’s play, meanwhile, was constructed through the two central midfielders, Ruben Zadkovich and Zenon Caravella, who collected possession in deep position and hit a large number of sideways balls towards Goodwin and Taggart. Overall, though, there was a lack of imagination and creativity in open play. Neither no.10 got on the ball frequently, nor did the strikers get in behind the opposite defence. In the first half, there was a noticeable intent from either side to build attacks out from the back, with either one of Perth’s two deeper midfielders, Jacob Burns or Steven McGarry, dropping into defence. In a position where they had split the two centre-backs, they had lots of time on the ball, and attempted to hit diagonal balls towards the wingers. Van Egmond was probably concerned about this, and increasingly, Zadkovich began moving from midfield to press Perth’s deepest midfielder. With him closing down alongside the front two, Burns and Bridges, it became a lot more difficult for Burns or McGarry to find time and space – and after Zadkovich charged down Danny Vukovic inside the penalty area, Perth became significantly more cautious and direct with their passing. Still, this wasn’t particularly important towards the final result, and perhaps just illustrates the low-tempo nature of the contest. At the start of the second half, Sidnei switched over to the right, and it seemed like Perth’s attackers had more freedom to move inside and interchange. It wasn’t until Chris Harold and Cameron Edwards came on in a double change that this was truly noticeable, however. Perth seemed to be halfway between 4-2-3-1 and 4-3-3, with Burns now essentially anchoring two playmakers, two wingers and Jamie MacLaren. It was a positive move, and contributed to Perth’s best spell of the match. Newcastle, meanwhile, had their chances, even if the closest shot to a goal – when Gallaway hit the bar – seemed intended as a cross. All of their changes were like for like, even when Kew Jailiens was forced off with injury. His replacement, Jacob Pepper, a very versatile player, simply replaced him in defence. Goodwin, meanwhile, despite being shifted back to his favoured left-sided position midway through the match, was taken off early in the second half for James Brown. In a broader sense, Goodwin’s a good example of how disappointing Newcastle have been. His right-side deployment here seemed like a move simply “for the sake of trying”, rather than for any particular reason. The commentary suggested it could be so he could cut down the inside of Scott Jamieson onto his preferred left foot, but he didn’t do this during the first half – in fact, he didn’t really do anything. It’s worth questioning why Van Egmond’s 3-4-3 formation, used in pre-season, never features, except when the side is chasing a game. Van Egmond also raved about Goodwin becoming a star at left-back – but the youngster barely plays there. There’s an enormous chasm between what he says and what Newcastle actually do on the pitch. In the context of this match, none of Newcastle (and Perth’s) attacking quartet got significant time on the ball, and its little surprise that Zadkovich finished the game with the most passes of any player in the attacking third. Even then, a lot of those passes were from set pieces, underlining the lack of creativity in open play. A focus on wing play, and two similar formations, resulted in little space for either team, except in deep positions. Of course, you can point to a lack of clinical finishing to explain the result – as both coaches did – but the greater issue was with the complete lack of opportunity for the number tens to get on the ball. Burns and Edwards were easily crowded out in central areas, and there needed to be more cleverness in attacking movement from both teams.